In February 1944, as Japanese military advances threatened to overwhelm New Guinea, a tiny, four-pound Yorkshire Terrier was discovered hiding in the island's thick jungles. A total mystery as to her origins, she was adopted by US Army Air Force Corporal William "Bill" Wynne, an air-crewman in a photo reconnaissance squadron, becoming an irreplaceable lucky charm for the unit. When Smoky saved Wynne's life by barking a warning of an incoming kamikaze attack, he nicknamed her the "angel from a foxhole." Smoky's exploits continued when she jumped for the unit in a specially designed parachute and famously joined the aircrews flying daring sorties in the war-torn skies. But her most heroic feat was running a cable through a seventy-foot pipe no wider than four inches in places to enable critical communication lines to be run across an airbase which had just been seized from the enemy, saving hundreds of ground-crew from being exposed to enemy bombing. In recognition of her efforts, Smoky was awarded eight battle stars. 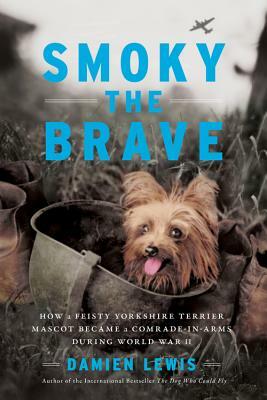 Smoky the Brave brings to vivid life the danger and excitement of the many missions of World War II's smallest hero. "A well-researched biography in the war dog genre." "How a plucky pooch helped with the war effort." "How a tiny Yorkshire terrier became a WWII hero."